HOUSTON (CN) – Brazoria County, home to over 300,000 people south of Houston, tweeted orders Tuesday to “GET OUT NOW! !” as a levee at Columbia Lakes failed. 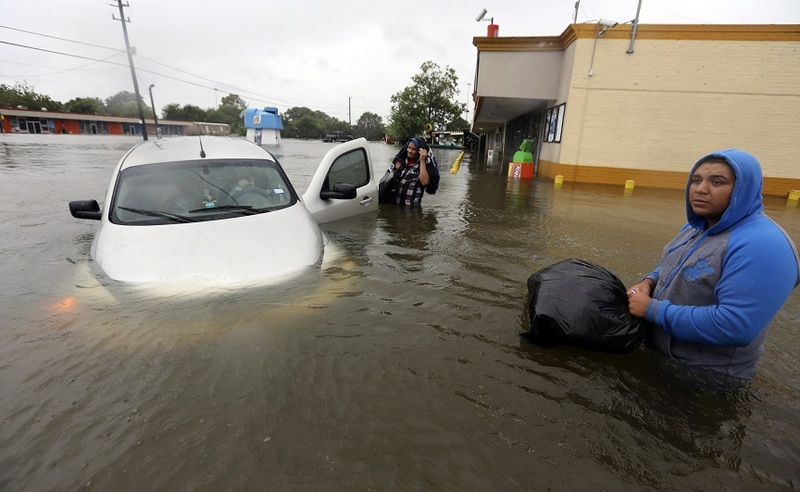 The dire situation in Texas’ largest city went from bad to worse as the levee was breached, two reservoirs overflowed and rain continued to fall. Brazoria County tweeted Tuesday morning that the levee at Columbia Lakes has been breached. The message said, “GET OUT NOW! !” Brazoria County is located south of Houston, and is home to more than 300,000 people. Officials were forced to “explore potential impacts to structures along Buffalo Bayou,” Houston’s main waterway, after record levels of rain filled the Addicks and Barker reservoirs in west Houston, according to the Houston Chronicle. The Harris County Flood Control District said that the Addicks and Barker reservoirs were both overflowing by Tuesday. Jeff Lindner, a meteorologist for the district, said some homes could remain underwater for as long as one month. “Disastrous flooding is occurring on the west fork of the San Jacinto River. Water is likely into the second story of homes, if not over the rooftops, along the river,” he said. A Harris County official told Reuters that roads and bridges are beginning to fail in the Houston area due to the stress caused by flood waters. Local CBS affiliate KHOU posted a video showing a concrete freeway barrier breaking and falling into the water on Highway 59 at the San Jacinto Bridge downtown. An Exxon Mobil also confirmed Tuesday that Hurricane Harvey damaged two of its refineries in the area, causing hazardous pollutants to be released into the air, according to a Washington Post report. President Donald Trump arrived in Texas on Tuesday to a scene of devastation caused by Harvey, the first major natural disaster of his presidency. The president and First Lady Melania Trump came to Corpus Christi to see the federal government’s response to the massive storm that has caused catastrophic flooding in Houston. He was briefed on Harvey at a local fire station and was joined by Texas Gov. Greg Abbott, U.S. Sens. Ted Cruz and John Cornyn and U.S. Rep. Blake Farenthold. Trump left Corpus Christi on Tuesday afternoon for Austin, where he’ll meet with more state officials. Boat and truck rescues continued Tuesday and city officials called for volunteer nurses and mental health workers, towels, socks and blankets to be delivered to a downtown convention shelter where nearly 9,000 people have taken shelter. A Houston police officer drowned in the floodwaters, bringing the storm’s death toll 15. The George R. Brown Convention Center reached its 5,000 people capacity Monday night, but Mayor Sylvester Turner said it will keep accepting evacuees as Tropical Storm Harvey continues to dump rain on a region inundated by the worst flooding in its history. Turner set up a Hurricane Harvey Relief Fund in response to calls from people and companies across the United States who want to help flood victims. “We are getting calls from across the country and right here in our hometown, and the generosity of people who understand this disaster is truly amazing,” Turner said in a statement. “We cannot evacuate 6.5 million people in two days,” Turner said when a reporter pressed him about a lack of evacuation plans Tuesday morning. Turner criticized “talking heads” who were critical of how he is helping displaced residents. He said that pundits should talk less and instead send aid in any way they can. Residents in the Houston suburb of Webster stood in line for nearly two hours as grocery stores began to open. Though locals said they escaped the catastrophic flooding that affected Houston over the weekend, many were running low on food and other supplies. (Photo by Matt Cooper/COURTHOUSE NEWS SERVICE). As the rain let up Tuesday afternoon, residents began to line up outside of grocery stores to resupply. At a Food Town grocery store in Webster, just south of Houston, residents said they waited as long as two hours. Management only allowed 10 people into the store at a time. Local resident Mike Guillory said that though he did not suffer any flood damage at his home, he was running low on essentials. Randall’s Food Markets has 20 grocery stores in Greater Houston. Some of its Houston stores have opened up and some have not due to road closures from Harvey, spokeswoman Connie Yates said Tuesday. Asked about the people queuing up in front of the stores, she said Randall’s is only letting in a few customers at a time to avoid overcrowding that could lead to code violations and endanger the safety of customers and the skeleton crews that have been able to make it to work. “We’re just trying to take care of our customers and not have so many in the store at one time that it’s overwhelming to them,” Yates said. She said the stores are being restocked, but Harvey has hindered those efforts. “We were able to make some deliveries today and we have some plans to make deliveries in the morning. The minute a roadway opens up to a store from our warehouse the truck goes. We’re trying to get them restocked just as quickly as we can, but all the time being mindful of the safety of our drivers and our customers and employees,” she said. Randall’s, a subsidiary of Albertsons, is stocking the Houston stores with trucks traveling from its warehouses in North Texas and northwest Houston, Yates said. After facing criticism on social media, Joel Osteen’s Lakewood Church responded Monday evening to claims that it had not opened its 16,000-capacity megachurch as a shelter. Don Iloff, a spokesman for the church, told the Chronicle that the church had never been closed to the public and staff had been directed to assist anyone who came seeking aid. Social media users criticized the church for claiming it was suffering flooding after photos of relatively dry entrances to the church’s stadium-sized house of worship began circulating online. Lakewood responded by posting its own photos of flooded parking lots and sidewalks. The Mexican government has offered to provide “help and cooperation” to help its neighbor to the north deal with the impact of Harvey, “as good neighbors should always do in trying times.” It also said it would also help repatriate Mexican citizens affected by the hurricane who wish to leave the U.S.
After Hurricane Katrina in 2005, Mexico sent troops, food, medicine and water to New Orleans, assisting in the relief efforts there for weeks. The Trump administration has not yet indicated whether it would accept assistance from Mexico for hurricane relief. The Army Corps of Engineers said it plans to release up to 8,000 cubic feet of water per second from the dams on Tuesday to prevent them from cracking and unleashing even more devastating flooding in downtown Houston. The center of Tropical Storm Harvey has drifted to the Gulf of Mexico and forecasters say that dry air around it will prevent it from reforming into a hurricane, but they expect it to bring up to 10 inches of rain Tuesday and cause flash flooding in eastern Harris County, home to Houston, and counties to the south, east and northeast: Galveston, Chambers, Liberty and Jefferson. Harvey has caused flooding as far east as Beaumont, Jefferson County’s seat, 85 miles east of Houston, and floods have been reported as far north as Lake Charles, Louisiana. First responders from California to Florida are in Southeast Texas helping rescue people in boats, dump trucks and helicopters. The Texas National Guard has deployed all of its 12,000 guardsmen to the Houston area. They are taking people out of flooded neighborhoods in the beds of 20-foot trucks. Houston police and the Coast Guard have rescued more than 6,000 people from the flood, according to Houston and Coast Guard officials. Though the rain has subsided in Fort Bend County, west of Houston, officials there have ordered people near the San Bernard and Brazos Rivers to evacuate. The rivers have risen to record levels, but are not expected to crest until Wednesday or later, because runoff from days of rain is draining into them. Fort Bend County officials said early Tuesday that they have received reports of looters lying to people that their neighborhoods are under mandatory evacuation orders and breaking into their homes. Anheuser-Busch said Monday that it suspended its beer production at a plant in Cartersville, Georgia, and is canning water for storm victims. The company said it is delivering more than 155,000 cans to the American Red Cross stations in Baton Rouge, Louisiana and Arlington, Texas for victims of Harvey. Courthouse News reporters Matt Cooper and Kelsey Jukam contributed to this report.